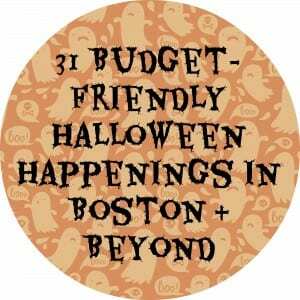 31 Budget-Friendly Halloween Happenings in the Greater Boston Area for 2013! Are you looking for some fun and budget-friendly events and activities this Halloween in Boston and beyond?! Look no further. Here are 31 fun events and activities throughout the end of October, and a few bonus events for the pets too. 1. Pru Boo: October 27, 2013 from 11-3pm at the Prudential Center. Wear your cutest costume and trick or treat for charity. Face painting, kid concert, pumpkin decorating and more as well. $4 donation to The Home for Little Wanderers. 2. Halloween Happenings at the Cambridgeside Galleria: October 30, 2013 from 4-6pm. Enjoy trick-or-treating and grabbing a bag of goodies at the Cambridgeside Galleria. Please bring a canned good. 3. 2nd Annual Halloween Event at Legacy Place: Saturday, October 26, 2013 from 12-2pm. Compete in a costume contest, enjoy trick-or-treating, partake in seasonal crafts and more at Legacy Place on Saturday! Free, but donate a canned good or make a monetary donation to the Greater Boston Food Bank. 4. Trick-or-treating at the Arsenal Mall: Sunday, October 27, 2013 from 11am-1pm at the Arsenal Mall in Watertown. Enjoy store to store trick or treating, entertainment, glitter tattoos, and complimentary cider and treats. Free for children 13 ages and younger. 5. Trick-Or-Treat At The Street: October 27, 2013 from 1-4pm at The Street in Chestnut Hill. Enjoy a fun afternoon for Halloween Festivities with trick-or-treating, crafts, music, free treats and more. 6. South Shore Plaza Boo-Bash: October 26, 2013 from 12-3pm at Center Court at the South Shore Plaza in Braintree. Enjoy face-painting, crafts, a costume contest and more! 7. Halloween Boo-Bash: Saturday, October 26, 2013 from 12-3pm at Square One Mall in Saugus. Trick-or-treat at the Square One Mall on Saturday. $1 per child and must register at Guest Services. 8. Mall-O-Ween 2013: Thursday, October 31, 2013 from 5-7pm at the Woburn Mall. Fill your candy bag at participating stores on Halloween night! 9. Halloween Party at Burlington Mall: Saturday, October 26, 2013 from 11am-1pm at the Burlington Mall (Upper Level Food Court). Enjoy music, games, a costume contest and more. Goody bags will be given out to the first 100 attendees! 10. Trick or Treat at Patriots Place: October 29, 2013 from 12:30-1:30pm at Patriots Place in Foxboro. Wear your costume and trick or treat around Patriots Place for goodies! 11. Kids’ Halloween Party: Thursday, October 24, 2013 from 3-6pm at the Hill House. Festive crafts, cookie-decorating, face-painting, and more at this fun party geared for young children. Free, but please bring a can good if possible. 12. 3rd Annual Halloween Jam: Saturday, October 26, 2013 at 2pm at the Community Music Center of Boston. Enjoy a spooky and kooky Halloween concert geared for kids 0-8! Free. 13. New England Aquarium Free Admission for Costumed Kids: October 26-27, 2013 at the New England Aquarium. Kids in costume get in free this weekend with a paid adult ticket! 14. Halloween Party at Castle Island: October 26-27, 2013 from 12-4pm at Fort Independence. There will be a lot of fun on Castle Island with a haunted castle, storytellers, magicians, refreshments, and more! Free, but children MUST be accompanied by an adult. 15. Boston Public Library Halloween Events: Event daily at local Boston library branches. Check out your local Boston Library for fun Halloween events crafts, Halloween story time, movies, and more. 16. Salem Haunted Happenings: Events daily in Salem, Massachusetts. Is there a better place to celebrate Halloween than Salem, MA? Check out some great Haunted Happenings all month. 18. Halloween Night Walk: Friday, October 25, 2013 from 7-8pm in Dorchester. No flashlights allowed through a spooky walk through the forest! (Costumes and Strollers not recommended). 19. Mayor Menino’s Fall Pumpkin Festival: Sunday, October 27, 2013 from 4:30-6:30pm at Boston Common Frog Pond. This free family-friendly event will include a Halloween parade, puppet show, magic show, and more. Can donations for CANshare and a small (8-inch or smaller) carved pumpkin are encouraged. 20. Pumpkin Pageant at Fort Point Channel: Thursday, October 31, 2013 from 12-4pm at the Boston Children’s Museum. Head to Fort Point to vote on your favorite pumpkin crafted by local companies! 21. SoWa Dia De Los Muertos: Sunday, October 27, 2013 from 10am-4pm at 460 Harrison Ave in the South End. Celebrate Halloween and the last open market outside for the season! 22. Spooky Reading and Discussion: Wednesday, October 30th at 7pm at Trident Booksellers & Café. The author of Ghosts and Cambridge will be at Trident on Wednesday to discuss his book about the bizarre happenings in the early days of Cambridge. 23. Radio BDC Retro Halloween Ball: October 31, 2013 from 9pm-1am at Ned Devine’s at Faneuil Hall. Dance the night away at this Retro Halloween Ball. Costume Contest will also take place. Free, but 21+. 25. Howl-O-Ween Bash: Thursday, October 31, 2013 at Howl at the Moon. Doors open at 4pm. Enjoy a costume contest (win up to $2,000 in cash prizes fyi), drink specials, and dueling piano show! 26. Halloween Pub Crawl: 3-days 10/26/13, 10/31/13 and 11/1/13 at the Mija Cantina and Tequila Bar. Enjoy some great bar specials at some of the best spots for 3 nights! 27. Free Halloween Pizza Party: Thursday, October 31, 2013 from 9pm-12am at Pizzeria Regina at 353 Cambridge Street, Allston. Check out some great performances and score $1 pizza slices and half-price apps! 28. Halloween Dinner at Ole Mexican Grille: Thursday, October 31, 2013 from 8-11pm at the Ole Mexican Grille in Cambridge. Enjoy a fun Halloween dinner with 4 tacos and 2 margaritas with a costume party and prizes. $29 a person through Gilt City, but save 40% on your first purchase if you sign-up through my friend link here. 29. Boorito at Chipotle: October 31, 2013 from 4pm-Close at local Chipotle restaurants. Stop by your local Chopotle on Halloween night and score a $3 boo-rito, bowl, salad, or tacos for $3. 30. Scary Face Pancakes at IHOP: October 31, 2013 from 7am-10pm. Kids can get free scary face pancakes at IHOP on Halloween! 31. Free Kids Meal at Boston Market: Now through October 31, 2013. Score a free kids meal at Boston Market with coupon, no dressing up necessary. 32. Faneuil Hall Pet Parade: Saturday, October 26, 2013 from 12-3pm at Faneuil Hall Marketplace. Watch, enjoy, and possibly dress up your pet for this annual pet parade! Pumpkin Carving and other festive activities will also take place. 33. Howl-O-Ween Pet Party: Saturday, October 26, 2013 from 1-3pm at the Seaport Hotel. Mix and mingle with other pet owners and pets and enter the pet costume party! Free and open to the public. 34. Canine Promenade: Saturday, October 26, 2013 from 12-2pm at the Charles River Esplanade by the Hatch Shell. Dress up your pet and march around the Esplanade to show off the best costumes. Refreshments, doggy goodie bags, demos and more. $15 a dog and proceeds go to the park (but it’s free to dog watch I’m assuming). 35. Bootiful Costume Party: Saturday, October 26, 2013 at your local Petco. Dress up your pet for a chance to win prizes! That’s it! 31 very fun human Halloween ideas and a few extra for our furry friends! What are you dressing up as and/or your pet this year? What budget-friendly Halloween events are you attending this year?! I found Boston Families on a Budget and Mommy Poppins Halloween Round-ups helpful compiling my post! Check them out for even more family fun Halloween ideas in Boston!